The end of an era is coming for seniors at the University of Miami. No more late-night studying, no more long research papers. Our 2017 seniors are baby birds about to spread their wings and leave the nest for the first time, entering the big, bad world. Before that happens, the Class of 2017 had one final hurrah to commemorate their years at the university, attending this year’s commencement ball on April 8. Held at the Watsco Center, the James Bond-themed ball was titled “Canes Never Die,” an homage to the outgoing graduating students and how they will forever be part of the UM family. 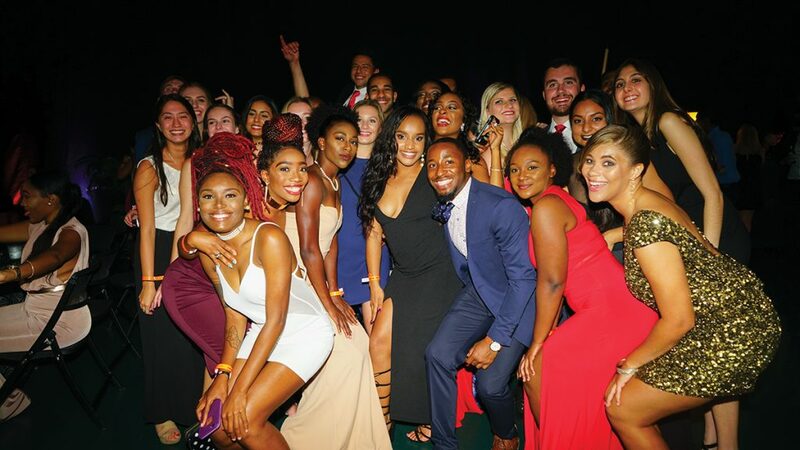 Coleman Reardon, the incoming vice-president of Student Government, helped organize the commencement ball and was determined to make this senior sendoff event a memorable one. More than 700 students, not exclusively seniors, came to the Watsco Center for free drinks, a s’mores counter, Angus Beef sliders and a dance floor. And the students sure danced. Outfitted in tuxedos and dresses that would make even James Bond blush, everyone looked secret-agent suave. Even the most unexpected students let loose on the dance floor. A belly full of liquid courage would be enough to help anyone dance the night away with reckless abandon. From Ariana Grande to the Cupid Shuffle – which everyone on the dance floor executed in sync – to throwbacks like Sean Paul’s “Get Busy,” the dance floor was alive. And in true Miami fashion, the crowd danced to Marc Anthony’s “Vivir Mi Vida.” There were those who effortlessly sang the lyrics, and those who, well, tried their best. A slideshow was displayed featuring seniors asked to use one word to describe their time here. The most frequently used words were opportunity, diversity, education and freedom. Just a month remains for the graduating class, and, though the seniors are leaving, the commencement ball made it clear that they will all be Hurricanes for life.